Acorns, which come from the Oak Tree can be very toxic to horses and ponies - especially when they are still green. Acorns contain tannic acid that can cause lesions in the intestinal lining with symptoms of weight loss and anorexia. Oak leaves also contain tannic acid and can be poisonous to a horse or pony. 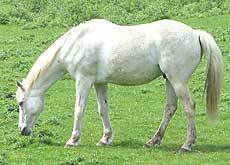 A horse can get a taste for acorns and search for them while grazing. It is fairly easy for a hungry horse to eat several pounds of acorns in a short period of which can leading to a fatal overdose. Some horses seem more susceptible to acorn poisoning than others who have a higher tolerance of the toxins in acorns. In Autumn 2010 over 30 ponies were killed by acorn poisoning in the New Forest in Hampshire, England. Oak and acorn poisoning causes kidney damage and gastroenteritis in a horse or pony. A Horse may show symptoms including staring coat, lack of appetite, blood in urine, abdominal pain and constipation followed by bouts of diarrhoea which may contain blood. Unfortunatley it is best to remove any oak trees from a pasture area used for grazing by horses or ponies. If this is not practical, or the oaks trees are protected, keep horses and ponies off the pasture around the trees during autumn while the acorns are falling. If you have to turn horses out in fields with oak trees fence off the trees - electric fencing is good for this. Rake up all the acorns as they fall to the ground. Although tedious this could save your horse's life. There is no known antidote to acorn or oak poisoning. However the horse or pony can be treated with drugs to reduce pain and to control diarrhoea.